Q: What is the History of the Traditional Somali? A: Simply put, the Traditional Somali is a long-haired Traditional Abyssinian with the appeal of a fun-loving and active short haired cat, but with a long coat. Its full tail gave them the nick name, "fox cat." It has the luxurious look of a long haired breed, but without the troublesome grooming that comes with a Persian. It has the same "wild look" and personality as the Traditional Abyssinian. The Traditional Somali is a smoothly balanced, medium sized cat with solid muscular development. A medium-long body sports a medium length, soft and silky coat, that requires little grooming. One to three inches long, the coat has shorter fur across the shoulders. A fluffy, full tail and tufts between the toes compliment its gorgeous appearance. Adding to this is a ticked or agouti coat with four to twenty bands of color on each hair. The ticked coat creates an aura, which is harmonized by a blending solid color on its underside. Somali’s have small litters of three to four, and the kittens mature slowly. Full size is reached at about eighteen months of age. Through the research I did, exact proof as to how or where the long-haired gene got into the Traditional Abyssinian breed was not made available. Perhaps it is a naturally-occurring long-hair gene that many of our accepted breeds have. Occasionally long-haired kittens were born to Traditional Abyssinian parents, so when speaking about the Traditional Aby an equal heritage belongs to the Traditional Somali. 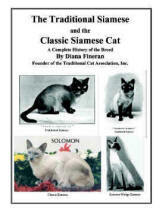 For the history of the Traditional Abyssinian, please refer to the Traditional Abyssinian section on our Home Page. 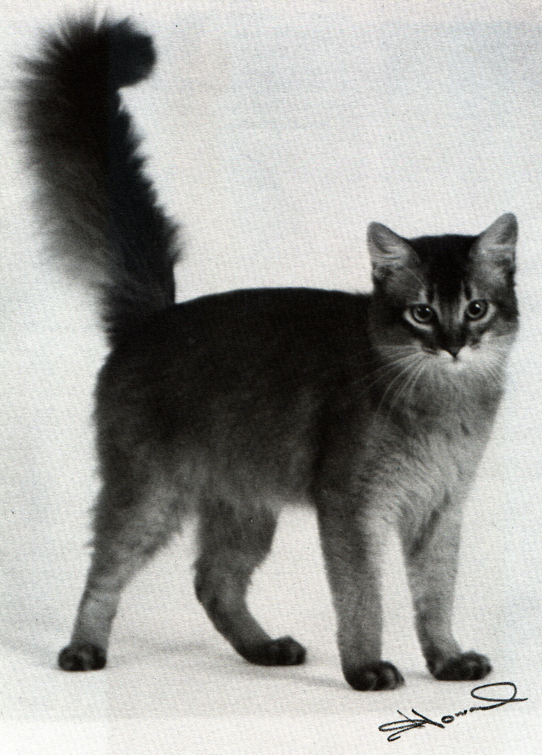 In any case, the Traditional Somali came to the fore in the cat world in 1979, when it was accepted and began to be shown in various cat associations. The campaigning in that year was done by Ruth and Bob Morris and Patricia Nell Warren. Genetic research indicates Traditional Abyssinians descended from a breed found in Southeast Asia and the coast of the Indian Ocean. Therefore, it is not a created breed, but a natural breed. It resembles the African Wildcat (Felis silvestris lybica), originally widespread in Africa, Europe and Western Asia and thought to be the progenitor of all domestic cats. The African Wildcat has been identified as one of the species mummified by the Egyptians during the time of the cat cult in that country. However, their true origins are lost in the obscurity of unrecorded history. During World War II the Abyssinian breed was out-crossed to Russian Blues to save the breed. This introduced the blue coloration. To bring back the "original" Traditional Somali, TCA, Inc. does not recognize blue or fawn as naturally-occurring colors. The first breeders of Somalis were Mrs. Evelyn Mague and Patricia Nell Warren in the U.S. In Europe the first Somali breeders were Mrs. Jutta Broisch, Cologne/Germany and Dorothea Rupprath-Kroeger of Burchana Cattery, Germany, who specialized in Black-Silver Somalis. The change (some call it the decline) in the Traditional Somali began in or around 1983, when the other cat associations began supporting a far more extreme, tubular, thin, cat with an extreme wedge-shaped head. Reports came from breeders saying, "In all countries the Somali has changed and been terribly weakened by inbreeding." Perhaps British and Scandinavian Traditional Somali's are our best hope for a return of the Traditional Somali. At recent shows a FULL GROWN Extreme Wedge Somali, was more like a kitten, no more than 6 to 7 pounds (male!). A good adult Traditional Somali should have considerable weight for its size. A tail that is too short is another common fault. 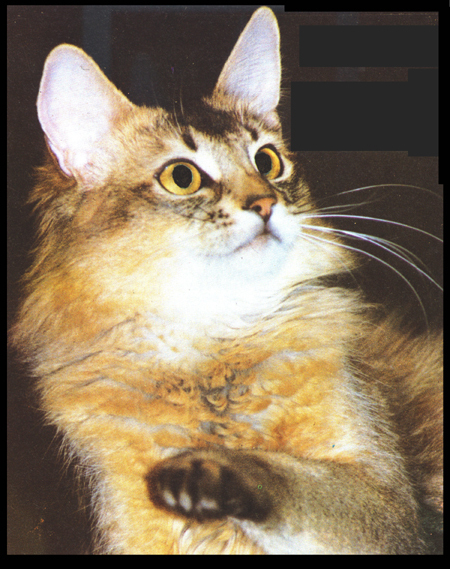 The faces of modern Extreme Wedge Somali's are also "whisker-pinched" and narrow and too fine boned, like the Extreme Wedge Siamese have become. My research revealed new problems in the extreme of the breed: renal amyloidosis, luxated patellas, retinal atrophy and some weird kind of anemia! These genetic weaknesses did NOT exist in the Traditional Somali. As long as inbreeding is continued, the breed will only get worse." The Traditional Somali goes through the usual two seasonal sheds, but other wise shed very little. Less, in fact, than other short haired breeds. A daily brushing is not required as in other long haired breeds, yet it is more for affection than a requirement. Their hair does not mat, although the longer fur on their hindquarters needs attention from time to time. Q: What is the health of the Traditional Somali? A: Health wise, the Traditional Somali has few genetic defects. The only references to any medical problems were about some bloodlines that are prone to gingivitis. Veterinary monitoring and feeding large portions of a high-quality dry food helps this problem. It has been noticed that a very few lines develop late-onset kidney disease, which usually manifests itself around age 8. This is quite rare, however. Some have a mild kind of digestive trouble or delicate digestion, causing them trouble with hair-balls. Giving hair-ball remedies can easily eliminate this problem.